~CAVIE'S COVE~ Charming cabin in Gatlinburg with BEAUTIFUL MOUNTAIN VIEW ! Just listed !! AWESOME cabin !! Newly renovated!! Sleeps 4 with 1 loft bedroom with king-sized bed and 1 full bath upstairs, and sofa bed and 1/2 bath downstairs. AMAZING views of Mt. LeConte & Clingman's Dome!! Fully equipped kitchen. Single serve Keurig coffee maker with complementary coffee & tea pods. Washer/Dryer, WIFI, & Dish TV. New copper roof, and gorgeous porch/deck with brand new Hot Tub and custom wire railing. Private, gated driveway. Security system with keyless entry & personalized access codes for visitors. Stone fireplace with remote control. New sunroom off of bedroom lets you enjoy the spectacular view year round !! Authentic, beautiful, 100+ year old barn doors add privacy and shade between bedroom & sunroom. Ample, level parking. Pets considered with signed pet agreement. They will even have their own lighted, picket fenced puppy yard!! NO smoking. Private, yet just minutes away from shopping, hiking trails, restaurants, downtown Gatlinburg & Pigeon Forge ! Beautiful view of Mt. LeConte and Clingman's Dome !! Single cup Kuerig, complementary coffee & tea. Dining table sitting 4 plus bar that sits 2 additional. We had the best time at this dog friendly cabin. Absolutely loved the fenced in area for our dog. Hot tub and grill were nice features. Great view! The cabin was very clean and very close to our hiking destination. Also really liked that the back porch was fenced off for our dog. We loved that we could be outside on the deck and he could be out there with us without worrying he’d run off. We loved it. Clean and great views. Our family (two parents, two children, 1 dog) recently stayed here and loved it. It was better than expected. -Very pet friendly, especially the fenced grass area. -Last but not least: THE VIEW! That alone was worth it. -We had to kill a handful of wasps that found their way inside, but this may be common for a cabin in the mountains (and fortunately they keep wasp spray on hand). -The open design and vaulted ceilings were generally a pro, but it allowed sound to carry very easily and made it difficult for someone to try to sleep upstairs while others were talking or watching TV downstairs. 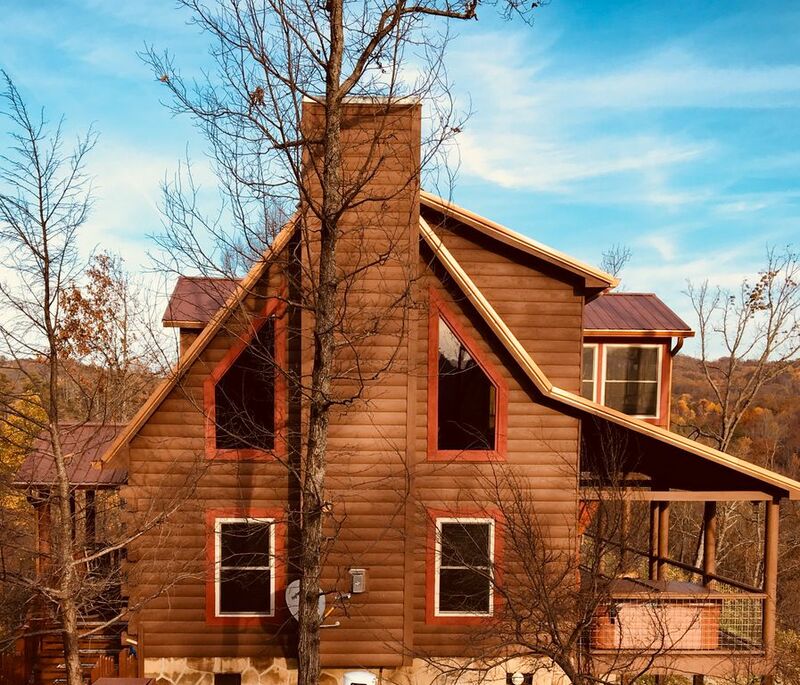 Overall, we were very satisfied with this cabin and it will definitely be our first choice the next time we visit the area. Beautiful view and Very nice Cabin all the way around. My wife and I very much enjoyed our stay at Cavie's Cove. The experience was excellent from start to finish with zero issues. Communication with the owner was outstanding and prompt. Very organized and well communicated instructions for cabin use and expectations. The Cabin was very nice and perfect for what we needed for our 3 night stay. Very much enjoyed the view from the Porch, as well as the Sun room upstairs in the Master Bedroom. We have two little Yorkie's and it was so nice having a great cabin set up for pets with the outside fenced in area. We would recommend this cabin at the highest level if the size of it fits your needs. It was perfect for my wife and I. FABULOUS!!! We will be back!! Everything was amazing and exactly what we expected. Very comfy and relaxing!